Out in the dark blue sea there lies a land called Crete, a rich and lovely land, washed by the waves on every side, densely peopled and boasting ninety cities.... One of the ninety towns is a great city called Knossos, and there, for nine years. King Minos ruled and enjoyed the friendship of almighty Zeus. To speak of Crete is often to speak of bulls. An ancient tale concerns a young woman named Europa, who was so generous as to give her name to a continent. Europa was the daughter of a king who ruled over what is now the Mediterranean coast of Syria. When Zeus caught sight of beautiful Europa on the beach he fell in love, assumed the form of a white bull and approached her. The maiden caressed him, and climbed onto his back — at which moment he carried her off to the island of Crete, where he revealed his true identity. As the ancient Greek writers said: "There they mingled in love", and Europa bore Zeus three sons. One of them was the legendary Minos. There is another tale about Minos, who later became king of Crete. When Minos refused to sacrifice a white bull sent to him by Poseidon, the sea-god revenged himself by seducing Minos's wife Pasiphae. Driven mad by strange desires, she is said to have hidden herself in a wooden cow. 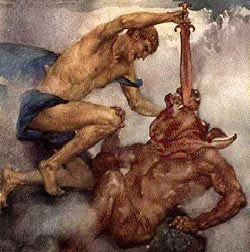 Poseidon assumed the form of a bull, prevailed over the. cow and months later Minos's wife gave birth to the Minotaur: a monster with the head of a bull and the body of a man. Minos built a subterranean labyrinth, in which he concealed the Minotaur. Yet, it was necessary to placate the monster as he grew older; he demanded a tribute from the city of Athens: they had no choice but to regularly send the Minotaur seven youths and seven virgins — which the monster devoured. Why did the bull play such an important role in mythology? Many cultures venerated the bull as a divine animal; he was, according to their myths, the first creature and a symbol of fertility. He was also associated with cattle raising and the first human settlements. The place where a bull stopped on its wanderings was considered a good place to settle — in fact the borders of many ancient settlements were marked by an ox drawing a plough. The bull also provided a standard of value and an object of barter: Homer tells us that a woman skilled at domestic work was worth four bulls, while a beautiful slave was worth twenty. The sport of bull-leaping was already known to Crete in Minoan times: it was an exercise for youths to measure themselves against the raw forces of nature and may also have had religious significance. 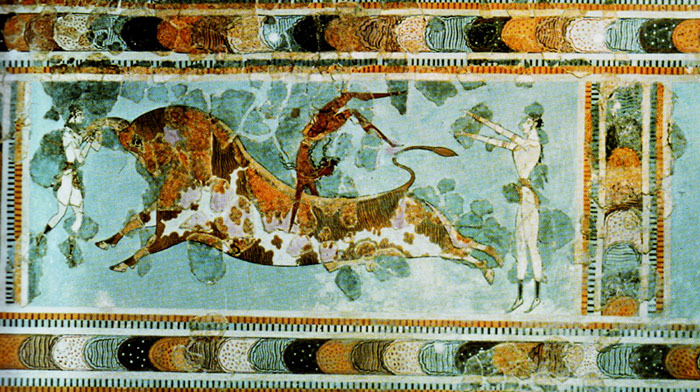 One of the earliest depictions of bull-leaping can be seen in Knossos near Heraklion, where, since the beginning of the twentieth century, a vast palace complex has been under excavation. It has been suggested this magnificent structure belonged to King Minos and that its nearly 1,200 rooms were the origin of the myth of the Labyrinth that housed the Minotaur.